Acknowledged author Not Available wrote Davis Advantage for Basic Nursing: Thinking, Doing, and Caring comprising 1800 pages back in 2017. Textbook and etextbook are published under ISBN 0803659423 and 9780803659421. 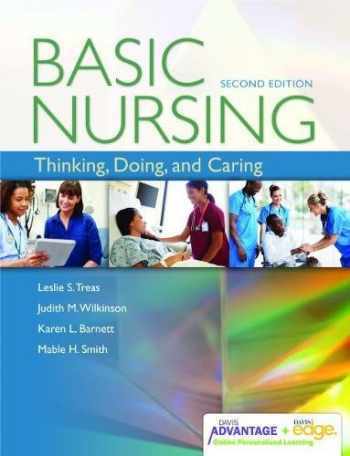 Since then Davis Advantage for Basic Nursing: Thinking, Doing, and Caring textbook received total rating of 4.5 stars and was available to sell back to BooksRun online for the top buyback price of $65.87 or rent at the marketplace. Text Explores the full-spectrum nursing model of thinking, doing, and caring and reinforces the model with critical-thinking questions and exercises in every chapter to help prepare students for practice. Uses multiple case studies per chapter to bring nursing theory to life and explain the nurse’s role in today’s complex healthcare system. Emphasizes the important aspects of safe and effective care to ensure better patient outcomes. Presents illustrated, step-by-step procedures with rationales that deliver all the information students need for the skills lab or clinical. Promotes effective care planning with care plans and concept care maps as well as NANDA, NIC, and NOC. Describes the research evidence related to the chapter topic and encourages further study. Davis Advantage—Personalized Learning Plans for Students Creates personalized learning plans that ensure students master the content. Charts a path for each student to follow based on their strengths and weaknesses. Offers multiple paths to learning success through an immersive, interactive, multi-media experience with a wealth of animation videos, case studies, dynamic exercises and quizzes. Tracks each student’s progress every step of the way; students know exactly how they’re doing and where they need to focus their studies. Davis Edge- Online Personalized Quizzing Features progressive quizzing, customized to each student’s knowledge level, that challenges them to reach higher levels of understanding, and identifies the areas in which they need additional review. Provides comprehensive rationales for correct and incorrect answers that teach students how to analyze questions critically—ensuring they understand why they answered a question correctly, and when they don’t, how to improve. Includes self-grading that provides immediate feedback as each quiz is completed. Offers test-taking strategies and tips to prepare students for course exams, ATI, HESI, and NCLEX® exams. Highlights alternate-format questions to build confidence for these more difficult question types, including “select all that apply” and “ordered response.” Lets students select practice quizzes by specific topics or concepts with a quiz builder. Monitors students’ overall progress and identifies their strengths and weaknesses in the Student Success Center.